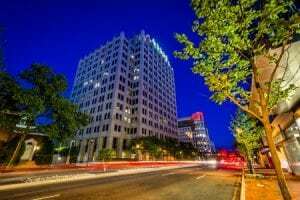 As one of the largest law firms in the area, Shulman Rogers provides a wide range of legal services for residents of Bethesda, MD and beyond. Our team is committed to raising the bar for client service in everything we do. We put your needs first and help you achieve a fast, stress-free resolution to almost any personal injury matter. We understand that a legal victory cannot come at the expense of your time or money. Using a creative, forward-thinking approach, we aim to get results and provide excellent communication every step of the way. Personal injury law, including traffic accidents, slip and fall accidents and dog bites. In any of these matters, a good settlement is one that helps speed up your recovery and gives you access to the care you need during this difficult time. While we always try to achieve a fast and fair settlement at the negotiating table, we are not afraid to bring your case to court if that is what it takes to get you the compensation you deserve. Medical malpractice, including negligence, misdiagnosis and any other related case of hospital or physician error. We can help you recover expenses related to a medical issue or get you compensation for lost wages or long-term disability occurring as a result of the poor judgment of a healthcare professional. Wrongful death as a result of an accident or medical malpractice, or change to Metro Washington. Losing a loved one suddenly is difficult in any situation. When it puts you in a precarious financial or emotional situation, it is even more important that you fully explore your legal options. The wrongful death lawyers at Shulman Rogers offer compassionate care during this difficult time. Federal Tort Claims Act (FTCA) for military personnel. If you have been hurt by a government employee or military vehicle, or you were injured in a veteran’s hospital, a special set of rules govern how and when you can sue the government for damages. The Shulman Rogers team includes several experienced FTCA lawyers who understand this complex area of the law and can help you achieve a favorable resolution to your case. When you need an injury lawyer in Bethesda or require representation in a legal matter, call Shulman Rogers first. With more than 40 years of experience serving clients in Maryland, our reputation alone is often enough to quickly bring an insurance company or another third party to the negotiating table. Your initial consultation with our team is always free. We will be happy to review your case and give you an honest assessment of the options available to you.